Moths typically first go for the hidden bits of felt (like this key rest felt), but will happily munch their way through all the piano felts – including the hammers!!! BE WARNED! If left untreated, moths can ruin your piano! For a good 5 years now, I have been recommending all piano owners to buy good moth repellent treatment and see that it is regularly replaced. 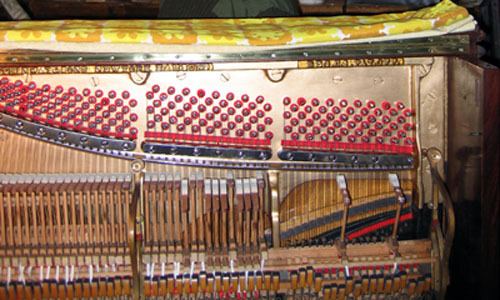 Of course, also see that your technician regularly inspects the piano to check the treatment is working. Uprights – inside the bottom door, in the pedal area. Grands – on top of the plate (iron frame), along the curved side. This entry was posted in Technical and tagged moth attack. Bookmark the permalink.